Theresa's Mixed Nuts: Buttermilk Biscuits Here We Go! Buttermilk Biscuits Here We Go! Does anyone else get that song stuck in their head when they think about buttermilk biscuits or is it just me? It's probably just me. Just like potatoes, I have a love for biscuits because they can be used for breakfast, lunch or dinner interchangeably. Biscuits and gravy for breakfast or use them as a side to lunch or dinner, but they are also great for dessert too when you use them as a base for shortcakes. I'm thinking with the upcoming Valentine holiday, if you are in need of an easy but pleasing dessert option, you can't go wrong with strawberry shortcakes. Don't get those store bought biscuits though. You gotta put in a little effort for your love, right? 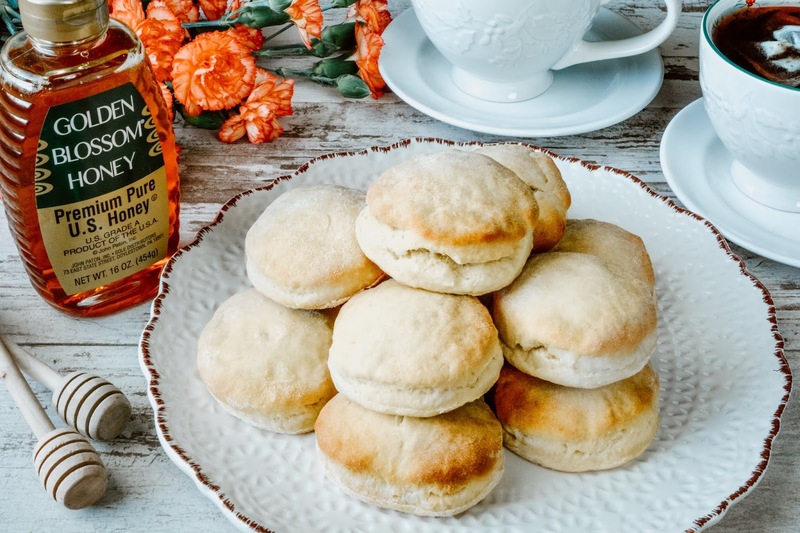 That's where these simple Golden Buttermilk Biscuits from Golden Blossom Honey come into play. Light, fluffy biscuits are one of the best things to come out of a warm oven, don't you think? Slather them with some butter (I use Kerrygold because nothing beats Irish butter) and some Golden Blossom Honey and you've got one heck of a yummy comfort food on your plate. But, for Valentine's Day, split them in half, fill with cream and honey soaked berries and you have an easy, but delicious holiday dessert. Trust me, you'll get bonus points for making your own buttermilk biscuits. They beat store bought any day of the week. Do you eat biscuits more for breakfast, dinner, lunch or dessert? I love them best for supper, nice and fresh with some mayo or soypate, but, alas, I've no one to bake them for me, the agony, the pain! You did such lovely photos, dear! I've never had them with mayo, usually just butter or jam. Dahlink, you don't need anyone to make them for you. I'm sure you'd do a better job of it yourself with your kitchen skills. Yeah, most anything beats store bought for sure. Nope, no song running through my head. Making them yourself sure does beat the refrigerated (AND I hate how those canisters pop) or frozen ones, without a doubt. This would be a great treat for the kids. They love strawberries and that's way better to give them than chocolate hearts! Allison has a little panic attack when I tell her to open those popping cans. We don't use them often though because they are high in trans fat. Making them yourself is always so much healthier! 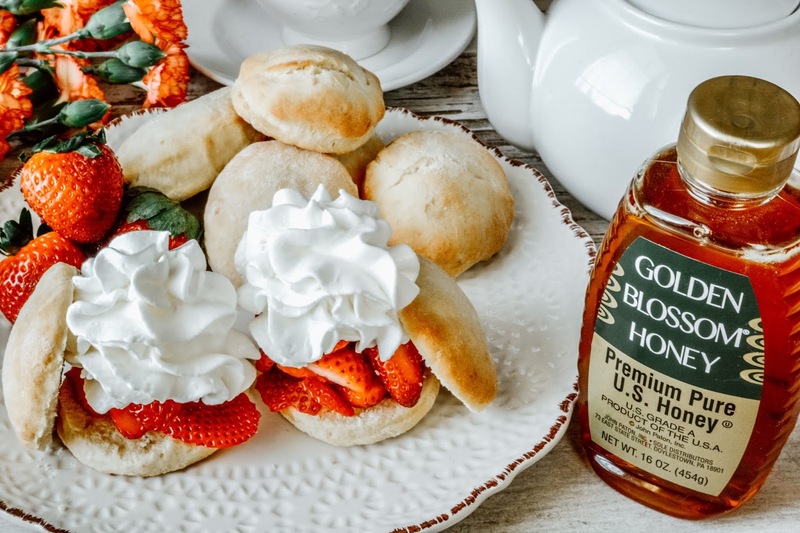 buttermilk biscuit, strawberry, honey sound excellent....love them. It's such a great combo, right!? Have a great day too! Now you're speaking my language! Biscuits are my jam! Homemade biscuits. Not those store bought things. Homemade is the best language! You can't beat the flavor of real, homemade buttermilk biscuits! They have such a classic breakfast flavor. Those sound so good! I love honey butter with my biscuits, so I think biscuits actually made WITH honey would be amazing! LOVE some buttermilk biscuits! Such a versatile food, they're flaky, and, above all, so delicious! I love them with butter and honey! They are great with so many different toppings, and you're right, so versatile too! Putting honey on my biscuits is something I have done since I was little. They're just not complete without it. Now I need to try incorporating some into the actual recipe for added flavor. Butter and honey slathered on a buttermilk biscuit is one of the tastiest foods ever, right!? I love biscuits with fruit! Sooo delicious and easy to make! These biscuits look insanely good. I love organic honey too. We have quite a bit here still. Your photos are divine. I love biscuits and honey. My gramma used to serve them to us for breakfast, like a breakfast dessert. Sometimes she sprinkled powdered sugar on it too. That sounds delicious Terri! You gramma sounds like she knew how to make the mornings special for you! Golden Buttermilk Biscuits with honey? Wow! It looks so fantastic. I'm carving for it now! Yummy! They look delicious and healthy of course.Would look around to check if I could anything like this here in India. I like them any time. I prefer honey, or something sweet on mine over gravy. This sounds like some delicious honey! I would love to try this recipe sometime. I'm not a big fan of biscuits but how you presented your buttermilk biscuits sure look very appetizing. Oh that sounds really good. I usually have biscuits for dinner if I have them. Did someone say biscuits? 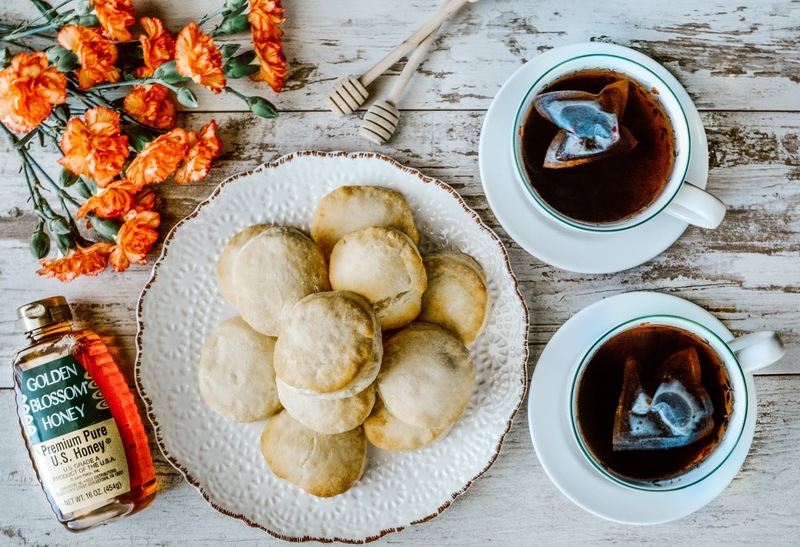 I love biscuits with honey. I'll give Golden Blossom Honey a try. That looks so incredible and delicious. I want to come over to your house for food!